My podcast has over 600 episodes (Every week for many years, you do the math! And subscribe!) website was written in ASP.NET Web Pages many years ago. "Web Pages" (horrible name) was it's own thing. It wasn't ASP.NET Web Forms, nor was it ASP.NET MVC. However, while open-source and cross-platform ASP.NET Core uses the "MVC" pattern, it includes an integrated architecture that supports pages created with the model-view-controller style, Web APIs that return JSON/whatever from controllers, and routing system that works across all of these. It also includes "Razor Pages." On first blush, you'd think Razor Pages is "Web Pages" part two. I thought that, but it's not. It's an alternative model to MVC but it's built on MVC. Let me explain. My podcast site has a home page, a single episode page, and and archives page. It's pretty basic. Back in the day I felt an MVC-style site would just be overkill, so I did it in a page model. However, the code ended up (no disrespect intended) very 90s style PHPy. Basically one super-page with too much state management to all the URL cracking happening at the top of the page. What I wanted was a Page-focused model without the ceremony of MVC while still being able to dip down into the flexibility and power of MVC when appropriate. That's Razor Pages. Best of all worlds and simply another tool in my toolbox. And the Pages (.cshtml) are Razor so I could port 90% of my very old existing code. 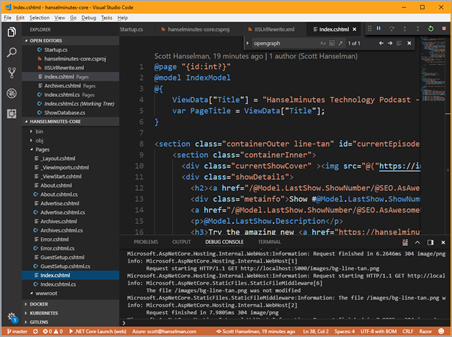 In fact, I just made a new site with .NET Core with "dotnet new razor," opened up Visual Studio Code, and started copying over from (gasp) my WebMatrix project. I updated the code to be cleaner (a lot has happened to C# since then) and had 80% of my site going in a few hours. I'll switch Hanselminutes.com over in the next few weeks. This will mean I'll have a proper git checkin/deploy process rather than my "publish from WebMatrix" system I use today. I can containerize the site, run it on Linux, and finally add Unit Testing as I've been able to use pervasive Dependency Injection that's built into ASP.NET. Here's the thing though, there's parts of my existing site that are 10 years old, sure, but they also WORK. For example, I have existing URL Rewrite Rules from IIS that have been around that long. I'm pretty obsessive about making old URLs work. Never break a URL. No excuses. There are still links around that have horrible URLs in the VERY original format that (not my fault) used database ids, like https://hanselminutes.com/default.aspx?ShowID=18570. Well, that database doesn't exist anymore, but I don't break URLs. I have these old URLs store along site my new system, and along with dozens of existing rewrite URLs I have an "IISUrlRewrite.xml" file. This was IIS specific and used with the IIS URL Rewrite Module, but you have all seen these before with things like Apache's ModRewrite. Those files are often loved and managed and carried around for years. They work. A lot of work went into them. Sure, I could rewrite all these rules with ASP.NET Core's routing and custom middleware, but again, they already work. I just want them to continue to work. They can with ASP.NET Core's Url Rewriting Middleware that supports Apache Mod Rewrite AND IIS Url Rewrite without using Apache or IIS! Here's a complex and very complete example of mixing and matching. Mine is far simpler. Remember I have URLs like default.aspx?ShowID=18570 but I don't use default.aspx any more (literally doesn't exist on disk) and I don't use those IDs (they are just stored as metadata in a new system. NOTE: Just want to point out that last line above there, where it shows the rewritten URL. Putting that in the logs or bypassing everything and outputting it as text is a nice way to debug and developer with this middleware, then comment it out as you get things refined and working. I capture that show ID and I rewrite (not redirect...we rewrite and continue on to the next segment of the pipeline) it to /18570?handler=oldshowid. That handler is a magic internal part of Razor Pages. Usually if you have a page called foo.cshtml it will have a method called OnGet or OnPost or OnHTTPVERB. But if you want multiple handlers per page you'll have OnGetHANDLERNAME so I have OnGet() for regular stuff, and I have OnGetOldShowId for this rare but important URL type. But notice that my implementation isn't URL-style specific. Razor Pages doesn't even know about that URL format. It just knows that these weird IDs have their own handler. That's it. I have a ton more to share as I keep upgrading my podcast site, coming soon. Sponsor: Get the latest JetBrains Rider for debugging third-party .NET code, Smart Step Into, more debugger improvements, C# Interactive, new project wizard, and formatting code in columns. WebMatrix did not get the credit they deserved back in the days! I also like the description of Razor pages: "being able to dip down into the flexibility and power of MVC when appropriate"
Very nice! I have a 2007 WebForms website that needs a refresh. I've committed several times in converting it to MVC, Core 1.0, Core 2.0, etc, but always drowned on the amount of different ways of doing the same thing and everything always looked too complex to grasp (programming is not my daily job). I have a few websites created for years (2005), can I use this concept to recreate them? And will the servers work? I ask why even asp.net core is complicated to find a server that works well. here in Brazil, fultrust is hard to find in a hosting provider. Recreating a site that uses API a lot for mobile and a web UI experience as well in the same site. I built the last one using MVC, but I read the suggestion for new development using razor pages and I don't know if that suggestion is appropriate for my project. Do razor page projects support API endpoints, too? When would it be recommended to use MVC instead of Razor Pages? For larger projects where it wouldn't be "overkill" to use MVC? Stacey - Yep, because it's MVC you can just add a WebAPI Controller and keep going. Frank - Use both. Use Pages for "page related stuff." That means, a page focused UI, forms, gets, places where MVC seems like it's too much. I felt MVC was too much for my site. It's really about the flow that makes you happy.